Near Naples there are the ruins of the ancient Roman city of Pompeii, which was destroyed in 79 AD during the eruption of the volcano Vesuvius. Nowadays a unique open-air museum is opened on the territory buried under the ashes of the city. Its exhibits, including entire streets and buildings, ancient frescoes, household items and much more, will immerse you in the two thousand years old history. 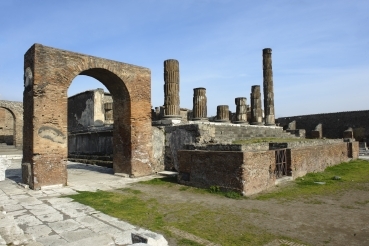 Since 1997, the huge architectural complex of Pompeii has been listed as a UNESCO World Heritage Site. According to the excavations, Pompeii was founded in the 6th century BC, although the city's early history is a mystery. It is established that the city became an ally of Rome in about 310. Pompeii played an important role on the trade route of the Appian way connecting Rome with the southern territories of Italy at that time. The city expanded and prospered until it was destroyed by the nearby Mount Vesuvius. The eruption started on August 24, 79, and lasted for about a day. This led to the collapse of three major cities – Pompeii, Stabiae and Herculaneum. The exact number of dead people cannot be established. During the excavations, the remains of about 2 thousand people were found on the streets and in the city buildings. The death has caught up with many people outside the city. During the excavations it was found out that under a thick layer of ash Pompeii was very well preserved. Archaeologists have found houses, entire structures and streets that were completely intact. For the first time, fragments of the walls of Pompeii's houses were discovered in the 16th century. After a while, inscriptions and parts of mosaics were found. Officially, the excavations of Pompeii have been started in 1748. The first head of the work Roque Joaquin de Alcubierre, was looking for items that represented any artistic value. All other finds were destroyed. This continued until 1760, until the excavation was headed by Francesco la Vega. At that time, some kind of restoration of the whole city was started, when artifacts and monuments were not taken out, but left in their place. A plan was developed for excursions to the ancient city. In the period from 1808 to 1814 the most active excavations were conducted. In 1870, archaeologist Giuseppe Fiorelli made a curious discovery: in place of the dead bodies, voids were preserved. Then it was suggested to pour them with a plaster to restore the last moments of life of the inhabitants of Pompeii. After a series of earthquakes, excavations were put on hold. Now only restoration works are carried out. Wall frescoes on houses and other structures of Pompeii. Temple of Apollo, dates back to 575-550 BC. Basilica, built in the 120-78 BC. 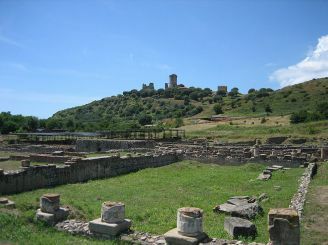 The Building of Eumachia from 14-37 AD. Temple of Jupiter, built in 150 BC. Amphitheater and the Great Palaestra. The Garden of the Fugitives. Lupanar, bakery, apartment houses and other buildings. It is more convenient to get to Pompeii from Naples by train of the Circumvesuviana company to the Pompei Scavi-Villa dei Misteri station. If you are in Rome, then you need to go to Naples from Termini station by train Trenitalia, to the station Centro direzionale di Napoli. 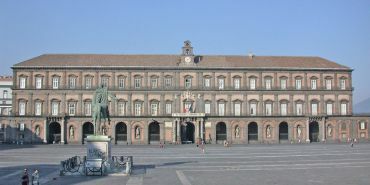 It is here that you need to change the train that runs from Napoli Garibaldi station to Pompei Scavi. Opening hours: from April 1 to October 31, the museum can be visited from 08:30 to 19:30, from November 1 to March 31 – until 17:00. Entrance to Pompeii is paid, except for children and people under 18.